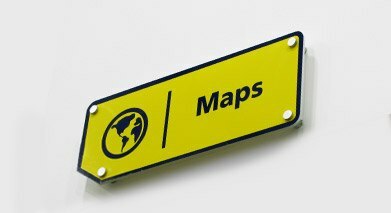 Our extensive range of signage displays are designed to provide solutions for a variety of commercial applications. From small price displayers to large-scale banner displays, use our signage solutions to create stunning in-store and window displays and to direct and inform your customers. Advertise in style! These minimal and aesthetic cable displays are ideal for displaying banners, prints, posters and graphics in offices and showrooms. Our range of wall and ceiling signage displays are designed for a wide variety of commercial applications — just choose the one the best fits your design and space. Showcase your brand or company with excellence by investing in high-quality lobby and office sign displays, ideal for branding and directional purposes. Browse our retail signage display options: add shelf signage to the edge of your glass or wood shelves, or utilize our table top signage displays for promotions, discounts and prices. Create aesthetic and practical literature walls, by combining brochure and catalog displayers with our flexible SlatSystem vertical and horizontal fixtures. What Types of Information Can be Displayed on Retail Signage? Retail signage is one of the most important factors for establishing a successful business. It doesn’t matter the store’s size, location or merchandise — retail sign displays provide the information your customers need and want to know. The right signage has the ability to drive foot traffic and convey essential information to your customers as well as your employees. Promotional and persuasive signage works to generate conversions, increasing overall sales. It helps to establish brand awareness and can be used to increase the perceived value of an item. Use it to introduce new products and boost the popularity of long-term staples. Directional signage for retail stores points to more than just the location of the restrooms, although those are important and can’t be overlooked when planning the design of the space. Directory signs tell your customers where to go, from aisle signs with product lists to the location of the service desk and dressing rooms. 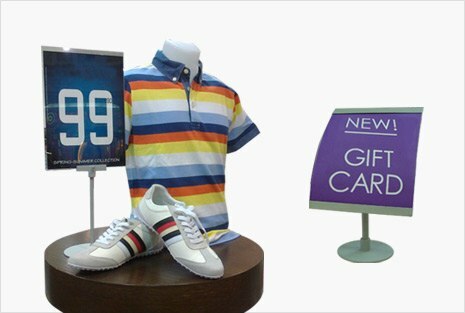 They’re must-have retail signage and should always fit seamlessly into your store’s thematic look. These signs also need to have an easy-to-read font and clear message. Informational signage is more utilitarian but can overlap with promotional and directional signs. It doesn’t have to look boring! You can present what customers need to know in a sleek, eye-catching way with our signage display products. 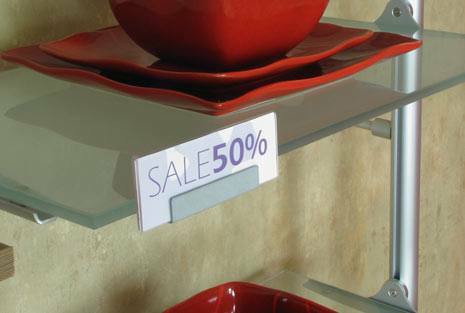 Typically, informational signage includes shelf labels, prices, sales specials and store policies. Promotional Signage for Retail Promotional signage for retail takes many forms and we offer expertly designed displays to fit your space and needs. 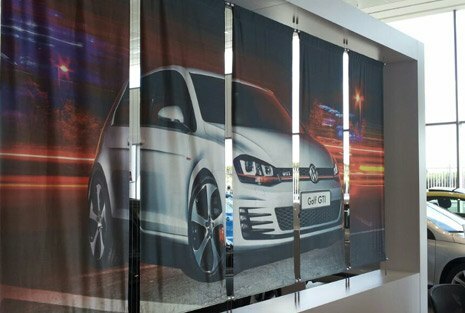 Let us help you advertise in style with high-impact banner displays ideal for large-scale prints, posters and graphics. 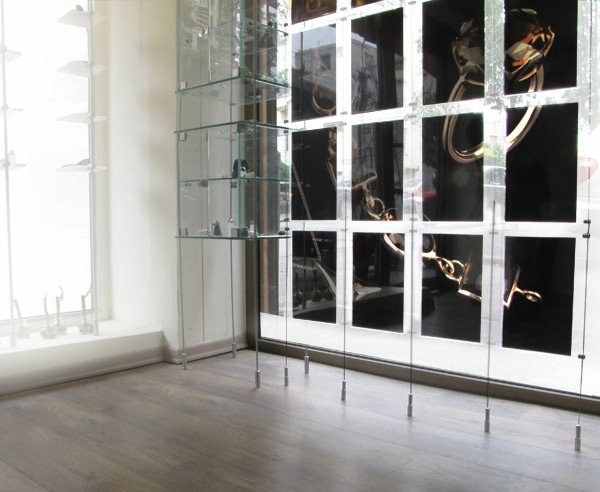 Need to make a statement in a showroom, expansive front window or other space? Our cable displays accommodate wall or ceiling signage and are available in a variety of materials including mesh, satin and vinyl. 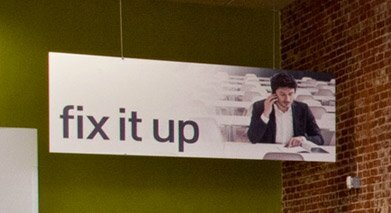 Wall Signage: How Does It Benefit a Retail Store? While custom displays that incorporate shelving, cabinets and free-standing units can dominate wall space in a store, there’s still a place for wall signage. 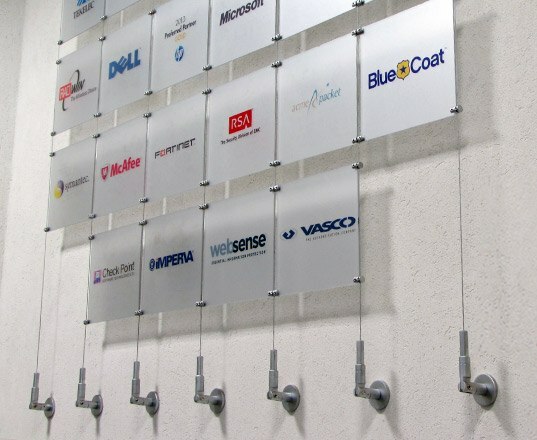 Wall signage offers multiple benefits. It allows you to install attention-grabbing graphics that can be seen by foot traffic, drawing in customers. It also makes it easy to boost brand recognition, introduce new products, and it even helps set the mood in the store. Wall space can be a good choice for directory signs as well. 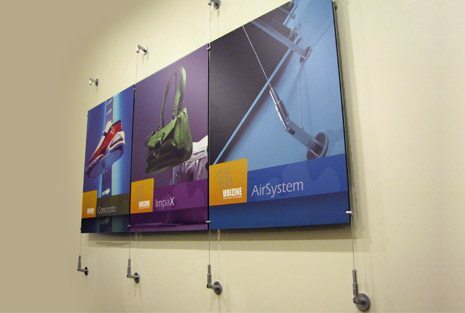 We have wall signage displays in materials that include acrylic, foam board, glass, MDF or metal panels. The checkout, customer service desk and certain product displays are primary areas for a literature display for store policies, loyalty programs and more. Look to our SlatSystem for several choices including the SlatStrip Literature Kit with three or four displayers. Customers appreciate being able to easily see and grab informational flyers, brochures and catalogs. You’ll love that it keeps items neat and uncluttered. Plus, the flexible system works with vertical or horizontal displays. Since 1995, UDIZINE has offered high-quality display fixtures to accommodate every budget. We are your retailer for innovative systems that effortlessly combine smart functionality with sleek, contemporary designs. With UDIZINE, your ideal display solutions are just a click away, including a wide range of retail sign displays. For the retail signage your store needs — from promotional to directional and literature displays — rely on UDIZINE. Contact us online or call to speak to a helpful representative today at 877-240-6149.